Cigarettes represent the biggest percentage of produced tobacco products in the world, accounting for about 96 percent of total tobacco sales. Cigarettes are also the most common way that people use tobacco globally. However, many people use tobacco products that aren’t cigarettes and these are usually called other tobacco products (OTPs). Due to the spread of products and ideas around the world, some forms of tobacco that were once only found in certain cultures and regions of the world, are quickly spreading to other countries. These cultural forms of tobacco are accepted in new countries and sometimes become very popular, but they rarely replace cigarettes as the tobacco most widely used. Beyond cigarettes, here are a few of the many OTPs used throughout the world. Betel quid with tobacco, also known as “gutka,” is a form of chewing tobacco from the Indian subcontinent (India, Pakistan and Bangladesh). Betel quid without tobacco is widely used in Southeast Asian countries. Prepared betel quid – either with or without tobacco – is also known as “pan” and includes a mixture of spices for flavor. Betel quid is used by placing a pinch in the mouth between the gum and cheek and sucking or chewing it. The excess saliva produced by chewing may be swallowed or spit out. Current Estimates of Betel Quid Use in the U.S.
Betel quid use is not currently monitored in the United States. Bidis (pronounced “bee-dees”) and kreteks (pronounced “cree-teks”) are types of cigarettes usually imported to the United States from other countries. Both have higher amounts of nicotine, tar and carbon monoxide than conventional cigarettes sold in the U.S.
Bidis are small, thin hand-rolled cigarettes imported primarily from India and other Southeast Asian countries. The tobacco in bidis is wrapped in a tendu or temburni leaf (plants native to Asia) and may be tied with a colorful string at one or both ends. They are either flavored or unflavored. Despite their small size, their toxin levels are higher than cigarettes because of the need to puff harder to keep bidis lit. Kreteks are sometime referred to as clove cigarettes and are typically imported from Indonesia. They contain a mixture consisting of tobacco, cloves and other additives. They may also contain a wide range of exotic flavorings and eugenol, which has an anesthetic effect, allowing them to be inhaled more deeply than cigarettes. Research on the health effects of bidi and kretek smoking has only been done in India and Indonesia. These studies suggest bidi smoking is associated with similar negative health effects as cigarette smoking, including increasing the risk of developing lung, oral, stomach, and esophageal cancer. Bidi smokers also have three times the risk for developing coronary heart disease and having a heart attack and four times the risk for chronic bronchitis, according to the Indian research. Research in Indonesia indicates that kretek smokers have 13-20 times the risk of abnormal lung function compared with nonsmokers. Kretek smoking is associated with an increased risk of acute lung injury, especially among individuals with asthma or other breathing problems. Current Estimate of Bidi and Kretek Use in the U.S. There is no existing research to determine the number of U.S. adults who smoke bidis and kreteks. However, an estimated 2 percent of high school students and 1.7 percent of middle school students are current bidi smokers. An estimated 1.7 percent of high school students and 1.1 percent of middle school students) are current kretek smokers. In February 2014, the U.S. Food and Drug Administration issued its first order to stop the further sale and distribution of four types of bidis currently on the market. The action marks the first time the FDA used its authority under the Family Smoking Prevention and Tobacco Control Act to order a manufacturer of currently available tobacco products to stop selling and distributing them. The products – Sutra Bidis Red, Sutra Bidis Menthol, Sutra Bidis Red Cone, and Sutra Bidis Menthol Cone – all manufactured by Jash International can no longer be sold or distributed across state lines or imported into the United States. Cigars come in many shapes and sizes, but all types are made of air-cured, fermented tobacco rolled together with a tobacco-leaf wrapper. There are 3 major types of cigars sold in the United States: large cigars, cigarillos, and little cigars (cigarette-sized). A large cigar typically contains a half-ounce of aged, fermented tobacco and takes 1-2 hours to smoke. A cigarillo is short (3-4 inches), narrow, and usually doesn’t include a filter. It contains about 3 grams of tobacco. A little cigar is typically the same size as a cigarette and includes a filter. Some cigars, particularly cigarillos and little cigars, come in flavored varieties, which may be especially appealing to youth. In the last decade, while the use of cigarettes has gone down, cigarillos and little cigars’ sales have increased dramatically. Much of the increase in cigarillo and little cigar smoking can be linked to increases in taxes on cigarettes, which are usually much lower than taxes on all types of cigars. In addition, these products are often flavored and can be sold individually, which makes them more affordable for youth, unlike conventional cigarettes which are more strongly regulated. There is a common misbelief that both large and small cigars are less addictive and safer to use than traditional cigarettes. However, cigars, cigarillos, and little cigars contain the same toxic ingredients as cigarettes, including nicotine, and can be just as addictive and harmful. In fact, cigar smoking leads to many of the same negative health effects found in regular cigarette smoking. All types of cigars can cause cancer of the lung, oral cavity, larynx, and esophagus. Heavy cigar smokers (and those who inhale deeply) are also at an increased risk for developing coronary heart disease and chronic obstructive pulmonary disease (COPD). Current Estimate of Cigar, Cigarillo and Little Cigar Use in the U.S. According to the 2016 Adult Tobacco Survey, an estimated 4.4% of Nevada adults smoke cigars, cigarillos, and little cigars daily and 10.4% smoke them weekly. Much of the rise in popularity of cigar smoking is due to recent marketing efforts that have promoted cigars as symbols of a successful lifestyle. The campaign to increase the visibility of cigars has included endorsements by celebrities, product placement in movies, and development of cigar-friendly magazines. Also, a review of formerly-secret tobacco industry documents finds that little cigars and cigarillos were intended to replace cigarettes as cigarette advertising became increasingly restricted. Advertising restrictions usually do not apply to cigars. Lozenges are shaped as pellets or tablets. Sticks have a toothpick-like appearance. Strips are thin sheets that work like dissolvable breath strips or medication strips. Because these products are new, little is known about the health effects of both short and long-term use. One major concern is the risk of nicotine poisoning. Public health agencies claim that dissolvable tobacco products pose a serious risk for unintentional poisonings in children and adolescents and should be more closely regulated. Although the tobacco companies claim that dissolvable tobacco products are intended for adult use, many health workers and lawmakers disagree. The are typically flavored, labeled either “Mellow” or “Fresh,” and packaged and sold in shiny cases, which could appeal to children. In 2016, the FDA finalized a rule extending regulatory authority to cover all tobacco products (including dissolvables) that do not fit the definition of smokeless tobacco products. The FDA now regulates the manufacture, import, packaging, labeling, advertising, promotion, sale, and distribution of all dissolvables. This includes components and parts but excludes accessories for newly-regulated dissolvables that are not considered smokeless tobacco products. Electronic cigarettes, e-cigarettes or vapor products as they are more commonly known, are nicotine-delivery devices that sometimes look like cigarettes in shape, size and general appearance. They usually include a battery component, a vaporizer or atomizer, and a cartridge with a mouthpiece. When the smoker puffs on the mouthpiece of the cartridge, the battery causes the tip of the e-cigarette to glow and the heat created by the battery turns the liquid nicotine into a vapor, or aerosol, of liquid, flavorings and nicotine. The aerosol can be breathed in and out by the user, creating a cloud that looks like cigarette smoke. Using an e-cigarette is commonly referred to as vaping. E-cigarettes usually have refillable containers of nicotine and flavorings, often called juice. Juice cartridges are available in varying amounts of nicotine, from no nicotine at all to upwards of 24 mg. Some of the flavors available include coffee, tobacco, apple, strawberry, banana and bubble gum. Juul was first launched in 2015. Juul is a new vaping device that has gone “viral”. The device looks like a USB flash drive and is rechargeable in a laptop. Juul is very popular with high schoolers and college age individuals. The popularity of Juul among youth has helped the product account for 73% of e-cigarette sales in the U.S. The data show that, by December 2017, Juul sold 3.2 million devices monthly and comprised nearly 1 in 3 (29 %) e-cigarette sales nationally. School around the nation are reporting that students fill the devices with marijuana, a homemade substance, or Juul-issued flavor “pods” which can deliver more than double the nicotine- and nicotine buzz- of other vaping products. Juul pod flavoring includes, Cool Mint, Crème Brulee, Fruit Medley, Mango, Silky Strawberry, Watermelon, Caffe Latte, Blueberry, etc. In 2009, the FDA found that samples of cartridges from the two leading brands of e-cigarettes contained detectable levels of known cancer-causing agents and other toxic chemicals, including diethylene glycol (commonly found in antifreeze) in one cartridge and nitrosamines in several cartridges. They also found that there was a lack of consistency in nicotine levels between the same products and some contained low levels of nicotine even when advertised as “no nicotine”. E-cigarettes and nicotine containers can be deadly to children or pets, who risk poisoning from ingesting the liquid nicotine. In Nevada, between 2011-2016 a total of 123 calls were received related to e-cigarettes poisonings. Of the 123 calls, 80 (65%) were related to children under the age of 5. The secondhand e-cigarette aerosol (incorrectly called water vapor by the industry), has been found to contain nicotine, ultrafine particles and low levels of toxins that are known to cause cancer. These fine and ultrafine particles may make respiratory ailments like asthma worse, and constrict blood vessels which could trigger a heart attack. FDA scientists have also found levels of cancer-causing nitrosamines in e-cigarette aerosol. Short term exposure of the chemical propylene glycol, one of the primary components of the e-cigarette aerosol, can cause eye, throat, and airway irritation and long term exposure can result in children developing asthma. Ventilation experts recommend not allowing e-cigarettes to be used indoors because of the chemicals found in the aerosol. In 2016, FDA finalized a rule establishing FDA oversight of e-cigarettes and all related Electronic Nicotine Delivery Systems (ENDS), after the federal courts had previously ruled that the FDA could regulate e-cigarettes as tobacco products. FDA now regulates the manufacture, import, packaging, labeling, advertising, promotion, sale, and distribution of ENDS. Review new tobacco products not yet on the market. Help prevent misleading claims by tobacco product manufacturers by evaluating ingredients of tobacco products. Require manufacturing establishments to register with the FDA and provide product listings and ingredients reports. Require pre-market review and authorization from the FDA for new tobacco products. Require health warnings on product packaging and in advertisements. Prohibit modified risk tobacco products (including those described as “light,” “low,” or “mild”), unless authorized by the FDA. Age verification by photo ID to prevent anyone under the age of 18 from purchasing e-cigarettes. Tobacco products may not be sold in vending machines (unless in an adult-only facility). At the state and local law, many governments have chosen to further limit and regulate e-cigarettes, including not allowing them to be used in areas where smoking is already prohibited by existing smoke-free laws. Many companies now make and sell e-cigarettes, including U.S. tobacco companies Altria, Reynolds, and Lorillard. There has been a rapid expansion of marketing e-cigarettes, in print, radio, television, and billboard advertising nationwide. E-cigarettes are also heavily sold online. E-cigarettes are often marketed as a way to get nicotine in places where smoking is not allowed or as a recreational alternative to smoking. Several e-cigarette marketers are also marketing their products as a means to quit smoking, despite a lack of credible evidence. Sales of e-cigarettes have doubled every year since 2008 and are projected to reach $1.7 billion in the U.S. alone. Cost is a major contributor to their increasing popularity, making them more affordable, and thus more attractive to young people. Recent findings from the National Youth Tobacco Survey show there was a 10-fold increase in e-cigarette use among high school students between 2011 and 2015. They are now the most commonly used tobacco product among teens. In 2015, a record-high 3 million middle and high school students used e-cigarettes – compared to 1.6 million who smoked cigarettes. The 2015 Nevada Youth Risk Behavior Survey results show that 24.8% of Clark County high school students reporting current use of e-cigarettes. In addition, 33% of all Nevada Quitline users report e-cigarette use. Hookahs, or waterpipes, have given mainstream popularity to a cultural and historical form of tobacco. Hookah use is most common among 18 to 24 year-olds and college students, who believe it to be safe. 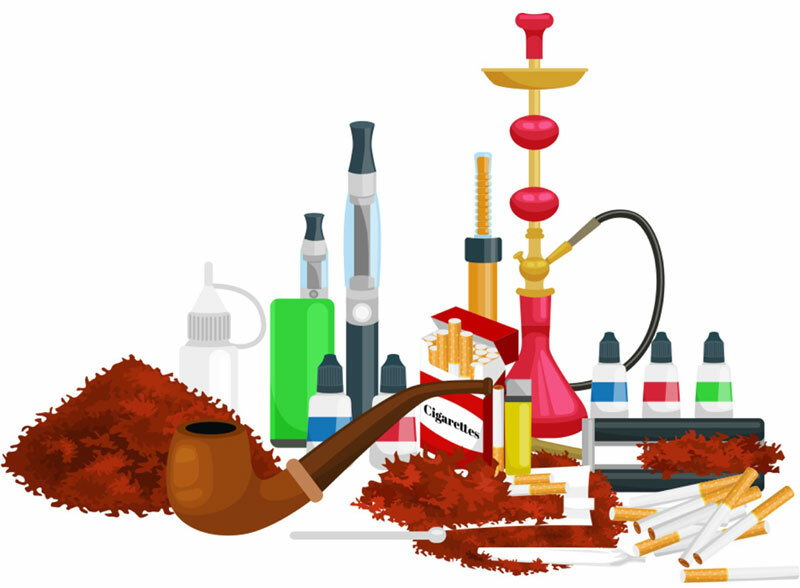 However, misconceptions about hookah smoking are widespread and need to be addressed. The hookah is used to smoke specially made tobacco through a waterpipe. Tobacco is indirectly heated with burning embers or charcoal which filters the smoke through a bowl of water. The smoke is then drawn through a rubber hose to a mouthpiece, where it is inhaled by the user. 1. The bowl where the tobacco is heated. 2. The base filled with water or other liquids. 3. The pipe, which connects the bowl to the base. 4. The hose and mouthpiece through which smoke is drawn. Hookah smoking began in ancient Persia and India and spread throughout the Middle East and Asia during the 15th century. In the late 20th century, new flavors were added to the mixture to make the hookah more appealing to women. As people moved from the Middle East and Africa, hookah cafes began appearing in European cities and the U.S.
Hookahs have become especially popular among urban youth, young professionals, and college students. Additionally, new forms of electronic hookah smoking (e-hookah) are now available. These products are battery powered and turn liquid containing nicotine, flavorings, and other chemicals into an aerosol, which is inhaled, much like e-cigarettes. The research on hookah use shows that smoking through a hookah carries the same or similar health risks as cigarette smoking. These negative health effects include increased risk of heart disease, lung, oral, and bladder cancer. While studies of smoke from hookahs found that it has similar amounts of nicotine, tar, and heavy metals as other tobacco products, some experts believe hookah smoking actually increases exposure to dangerous substances over other products. Because hookah smokers smoke over a much longer period of time – often 40 to 45 minutes, versus 5 or 10 minutes for a traditional cigarette – a hookah smoker could possibly breathe in as much smoke in a single session as smoking 100 or more cigarettes. The wood cinders or charcoal used to burn hookah tobacco creates additional health consequences for smokers as well. When burned, these substances release high levels of dangerous chemicals, including carbon monoxide. Some research shows that hookah smoke is actually more dangerous than cigarette smoke, because it includes smoke from the tobacco as well as the heat source used to burn the tobacco. Although more research needs to be done on the long-term health effects of hookah smoking, existing studies show that it carries many of the same risks as cigarette smoking and is not a safe alternative. Additionally, secondhand smoke from hookahs can be a health risk for nonsmokers. Hookahs are thought to be more enjoyable for smokers because the smell, taste, and smoothness of the sweetened tobacco provides a much less irritating smoking experience than cigarette smoking. Experienced smokers sometimes add other liquids, such as fruit juice or wine, to change the taste of the smoke. Hookah smoking is also usually less expensive than cigarette smoking. Hookah Use in the U.S. In 2010, the Monitoring the Future survey found that among high school seniors in the United States, about 1 in 5 boys (17%) and 1 in 6 girls (15%) had used a hookah in the past year. A 2010 study at the University of Nevada, Las Vegas (UNLV) found that 15.2% of college students there had smoked hookah in the last 30 days. The rise in hookah smoking in the U.S. may be the result of marketing efforts targeted towards college students. Hookah bars and cafes are commonly found in cities and towns near large colleges or universities, like UNLV, despite state smoke-free air laws. Based on U.S. business listings, more than two-thirds of the states currently have hookah bars or cafes. Although many states have laws banning smoking in almost all public places and workplaces, hookah bars and cafes are exempt from these laws in some states. Hookah bars can qualify for exemptions by identifying as a “retail tobacco establishment,” “tobacco bar or cigar lounge,” or a business that sells only tobacco products, whether for use onsite or elsewhere. Smoke-free air laws seem to have contributed to the popularity of hookah bars by making them one of the few indoor places where smoking is still allowed. Many smokers choose “light,” “mild,” or “low-tar” cigarettes because they perceive them to be less harmful than “regular” cigarettes. However, these are simply marketing terms. Smoking light cigarettes has the same significant health consequences as smoking regular cigarettes. In 2009, the Family Smoking Prevention and Tobacco Control Act was passed, which banned tobacco companies from using the terms light, ultra-light, low, or mild to describe their products. Before the passage of the law, cigarette brands that provided about 1-6 mg of nicotine were called “ultra-light.” Those that gave 6-15 mg of nicotine were “light,” and those that provided more than 15 mg of nicotine were considered regular or full-flavor. Although the smoke from light cigarettes may feel smoother and lighter on the throat and chest, they are not any healthier than regular cigarettes. As age, educational level, and income increase in individuals, the use of light or ultra-light cigarettes also increases. Use of light cigarettes is also higher among women than men. Light and ultra-light cigarette packaging and advertisements bragged about lower tar and nicotine numbers than regular cigarettes. This is because light cigarettes were tested on smoking machines that don’t smoke cigarettes the same way that people do. Light cigarettes actually tricked smoking machines. Tobacco companies made light cigarettes with tiny holes in the filters. These holes or “filter vents” thinned out the cigarette smoke with air when the smoking machine “puffed” on the filter, causing a falsely low measure of tar and nicotine levels. Many smokers didn’t even know that these tiny holes existed in light cigarettes. Unlike the smoking machine, when people smoke, they tend to cover the holes with their lips or fingers, and they block the vents. This inadvertently turns a light cigarette into a regular cigarette, giving the smoker a much higher tar and nicotine level than the smoker expects. Because people (unlike machines) crave nicotine, they may breathe more deeply on a cigarette; take larger, quicker, or more puffs; or smoke a few extra cigarettes each day to get enough nicotine to satisfy the craving. This is called “compensating,” and it means that smokers end up inhaling more tar, nicotine, and other harmful chemicals than the machine-based numbers show. According to a report from the National Cancer Institute (NCI), people who switched to light cigarettes from regular cigarettes were likely to inhale the same amount of dangerous chemicals as regular smokers. They also remained at high risk for developing the same smoking-related cancers and other diseases. The NCI concluded that light cigarettes provide no benefit to smokers’ health and are not an effective means of quitting smoking. The bottom line for smokers is that there is no such thing as a safe cigarette. The only proven way to reduce the risk of smoking-related diseases is to quit smoking completely. Tobacco pipes usually include a small chamber or bowl where the tobacco is burned, attached to the end of a stem and mouthpiece where the smoke is inhaled. Pipe tobacco is carefully treated and blended to achieve flavor qualities not available in other tobacco products. Like cigar smoking, pipe smoking differs from cigarettes in that users usually don’t inhale the smoke. Even so, pipes involve many of the same health risks as cigarette smoking. Oral, throat, lung, and tongue cancers, emphysema, and dental problems have all been linked to pipe smoking. Smokeless (“spit”) tobacco use is a public health problem on the rise. As more communities pass smoke-free laws banning cigarette smoking indoors, more people are turning to this equally dangerous tobacco product that doesn’t create smoke. There are many different kinds of spit tobacco, snuff being the most well-known. Snuff is moist, finely chopped tobacco that is placed between the cheek and gum and doesn’t require chewing. Some snuff is packaged in individual serving bags, so people can use it without spitting. Chewing tobacco, another form of spit tobacco, comes in three types: loose leaf, plugs, and twists. Loose leaf is shredded tobacco leaves made into strips; plugs are pressed into small, soft blocks flavored with licorice and sugar and then dried; and twists are dried and twisted into hard spirals. Smokeless tobacco contains 28 cancer-causing chemicals. Many oral health problems are strongly linked with smokeless tobacco including cancers of the mouth. Smokeless tobacco use can also lead to nicotine addiction and dependence. Current Estimate of Smokeless Tobacco Use in the U.S.
Smokeless tobacco use in the United States is higher in young white males, American Indians and Alaskan Natives, people living in southern and northern central states, people employed in blue collar or service/laborer occupations, and people who are unemployed. In Nevada, an estimated 2.3% of adults use smokeless tobacco. Smokeless tobacco use is much higher among men (3.9%) than women (0.7%). An estimated 4.5% of high school students in Nevada also use smokeless tobacco. From 1998 to 2010 (the most recent year for which data is available), the total advertising and marketing spend of the top-five smokeless tobacco companies in the U.S. increased over 200%. In 2010, these smokeless tobacco companies spent more than $440 million to advertise and market their products — a 77% increase from 2005 spending. The two leading smokeless tobacco brands for users aged 12 years or older are Skoal (25%) and Copenhagen (24%). Snus (rhymes with “goose”) is a moist powder tobacco product which is placed between the cheek and gum. Like snuff smokeless tobacco, it does not require the user to spit. Snus is commonly found in Denmark, Sweden, and Norway, but is now being test-marketed in the United States and several other countries. There are two main types of snus: loose, which requires the user to portion out a “pinch” for use, and pre-packaged, which is easier to handle than loose powder. Snus is different from other tobacco products because it is heated using steam, not fire, which results in a lower amount of nitrosamines (a known cancer-causing agent). However, snus also contains more nicotine than cigarettes, making it even more addictive than other tobacco products. The negative health effects of snus are similar to smokeless tobacco. These risks include developing lesions in the mouth, gum recession, and cancer of the mouth or tongue. A 2007 medical study* found that people who use snus had double the risk of developing pancreatic cancer. Although other research indicates that many snus users also smoke cigarettes (making it difficult to determine the impact of snus-use alone), this particular study was specifically conducted on non-smokers. More research is currently being done to determine the effects of using snus over an extended period of time. Snus was originally created in Sweden to combat a high smoking rate. About 12% of the Swedish population currently uses snus. The use of snus in other countries increased following the passage of indoor smoking bans. Many cigarette companies are now making and selling forms of the product which include Marlboro Snus from Philip Morris USA, and Camel Snus from Reynolds American Tobacco Company.